Rijal Alma is about to join the UNESCO World Heritage List. It is an essential step for this village, and it will drive even more tourists to the region. This village had won the Prince Sultan Bin Salman Award for Urban Heritage in 2007. A general plan was set in order to make sure that Rijal Alma is going in the right direction giving the fact that it’s a very resourceful place and a lot of achievements are planned for the village. "JEDDAH: The Saudi Commission for Tourism and National Heritage (SCTH) prepared the file of Rijal Almaa heritage village in Asir and handed it over to the UNESCO World Heritage Center in January 2018. 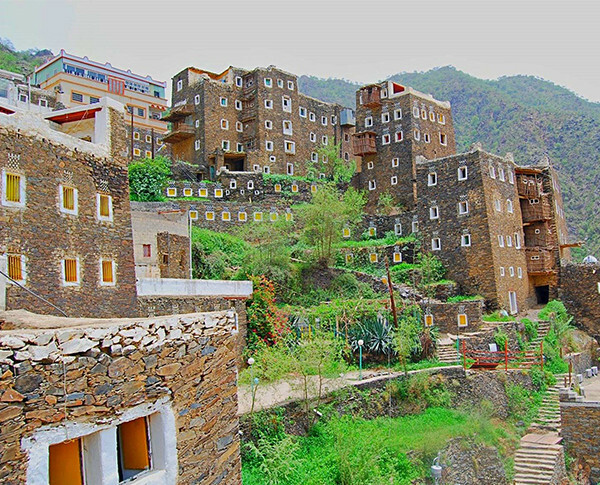 The village of Rijal Almaa had won the Prince Sultan bin Salman Award for Urban Heritage in 2007 and has become a tourist destination for those visiting the region of Asir. This importance comes as a result of the numerous historical, cultural, heritage and natural factors, and the hospitality and culture of its residents. The residents’ initiatives to preserve their village are driven by an awareness of its history, culture, nature and moderate climate — the main reasons behind the decision to rehabilitate and develop the village of Rijal Almaa. Those elements were the driving factor for a general plan for the development of the village, including its infrastructure, in addition to creating economic opportunities of heritage value that benefit the villagers. The development plan was the result of the collaboration between many parties that included the SCTH, the authorities of Asir region, a number of government and service agencies in addition to the villagers. Rijal Almaa witnessed many stages of development. At first came the open theater, which can hold up to 1,000 people, as well as the surrounding areas that are mainly shopping places that showcase the village’s famous products. Green spaces were increased by about 7,000 square meters, in addition to 15 canopies, family gatherings at the village entrance and the lighting of the highway leading to the village. The SCTH’s efforts to register heritage and archaeological sites to the Urban Heritage list fall under Kingdom’s Cultural Heritage Care program that includes a system of projects and programs to develop, highlight and preserve national heritage sites. The Commission has allocated a department, which is a part of the Commission’s antiquities sector concerned with the registering of site in with UNESCO. This department has specialized people and experts in the field and is directly supervised by Prince Sultan bin Salman bin Abdul Aziz, the Commission’s director. Saudi Arabia first started registering sites when the government approved the registration of three sites on the UNESCO World Heritage list in 2006. The SCTH later worked on the files of all three sites that were added to the list in 2008, 2010 and 2015, in addition to a fourth site that was registered in 2015. The fifth site was registered during the meeting of the World Heritage Committee held in Bahrain on June 29, 2018. A royal decree approved the Commission’s request to register 10 new sites to the World Heritage list that included the Rijal Almaa village on Oct. 24, 2014. This came after the SCTH asked the organization to add the 10 sites to its preliminary list through the Kingdom’s permanent representative."